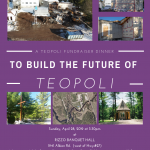 June 18, 2016 – Radio Teopoli, City of God Radio AM530 featuring Fr. Claudio Picccini C.P. July 2, 2016 – Radio Teopoli, City of God Radio AM530 featuring Fr. Claudio Piccinini C.P. The United Society - Roman Catholic Charitable Organization. In beautiful MUSKOKA, 185km from downtown Toronto. Follow Hwy.400 north to Barrie. Continue north on Hwy.11 past Orillia, to Canal Rd. and Cooperfalls Rd. Follow Cooperfalls Rd. (#52) and Housey’s Rapids Rd. (#6) to TEOPOLI.